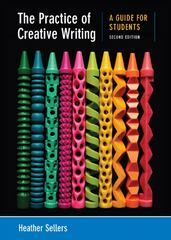 The Practice of Creative Writing 2 Edition Designed for all students in the introductory course, The Practice of Creative Writing has a simple message: you can do this, and it’s worthwhile to try. Heather Sellers, who writes in multiple genres herself, has developed an approach that focuses on the habits and strategies that produce good writing in any genre: Images; Energy; Tension; Pattern; Insight; and Revision. She teaches students how to focus, to generate lots of writing, and to get to the good stuff — the powerful imagery and the stories they really want to tell. She provides opportunities to be playful and to experiment at the same time she teaches students the importance of discipline and craft. This new edition gives students even more support and encouragement, with earlier attention to structure — because students struggle with this strategy — and with expanded coverage of revision and a wider range of genres they can use as generative tools.